What happens when a product has been manufactured and improved over a long period of time? It either goes off the market or it becomes superior in function and build. The Duffy 21 Old Bay electric boat has most definitely succeeded with the latter. With 45 years on the market, this boat not only speaks functionality, but also beauty and comfort. Just as the name might suggest, the boat is 21 feet in length and comes with a 26-inch draft, allowing it to maneuver through heavy bodies of water comfortably. The outer metallic wash of a new Old Bay is fancy enough to be left in its original form. 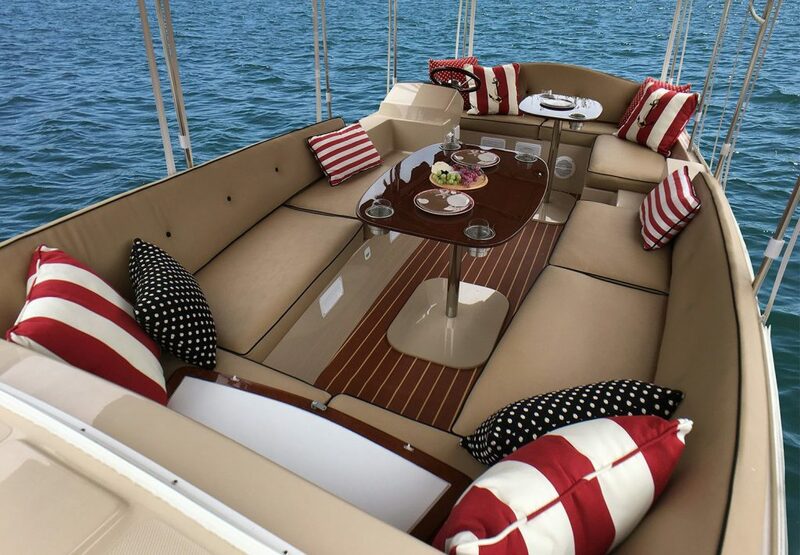 However, a buyer wishing for something truly unique can go ahead and customize the boat to their own tastes. The interior is where the 21 Old Bay proves its worth. This boat is able to comfortably seat up to 12 people, which means you can call your friends over and go for a weekend afternoon ride. The interior is highly accessorized in well-polished wood, wooden articles, as well as traced fiberglass. The aft and forward components each have a set of wooden tables, complete with drink holders, so no spilling your drink on the floors. Nonetheless, even if you do, the teak-looking vinyl floor is easy enough to clean. The dashboard is also highly complemented in elegant wood, and to complete the wooden finish is the mahogany manual steering wheel. 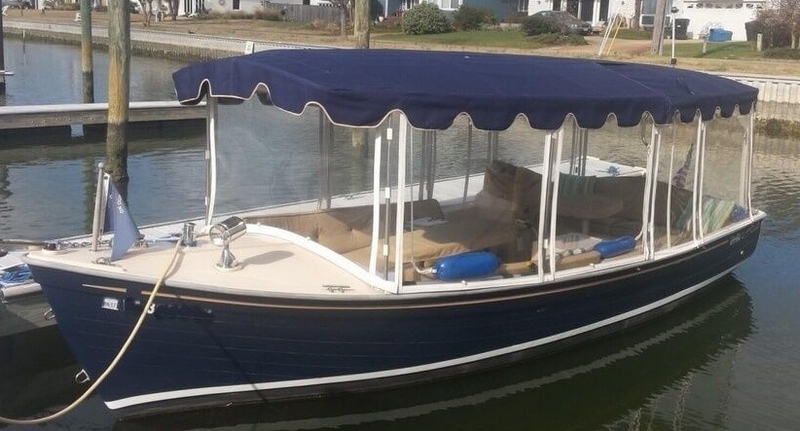 The Duffy 21 Old Bay electric boat comes with its own bar too. A mini bar actually, but spacious enough to keep those bottles safe and out of the way as you enjoy your ride. To sustain an environment of comfort, the boat has a foldable sun roof. The medium-thickness fabric seats are good enough to maximize the passengers’ comfort. There is ample lighting across the whole boat, from the aft all the way to the front. 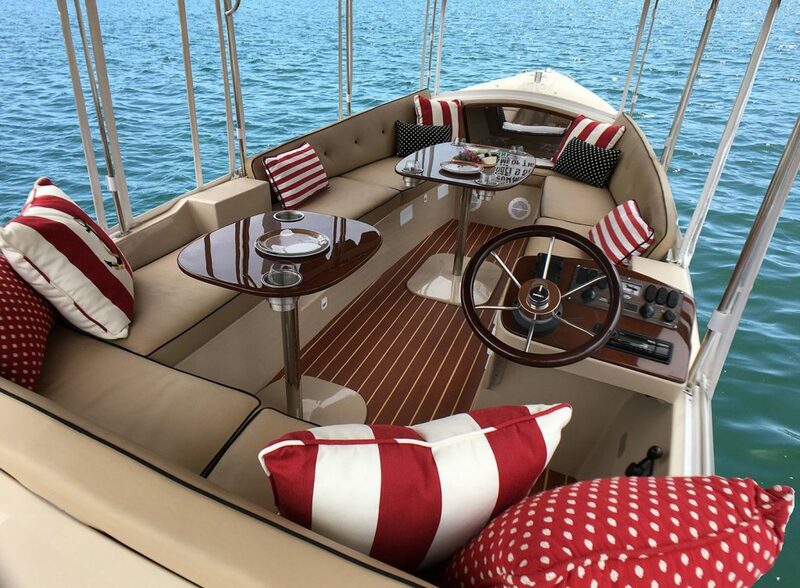 Furthermore, to accentuate on the comfort, the boat comes equipped with a splendid entertainment unit composed of an iPod docking station and a sound system with four waterproof speakers. To protect the interior from climatic-related damage, the boat has an anti-UV All-Weather Cabin Enclosure. The Old Bay has an LED lit navigation system to allow for navigation in the dark. The fuel gauge has that analog feel that reminds you of the boat’s long heritage. It hits a high speed of 6 MPH, which is quite slow for some people, but then again, who needs high speed when on a leisure cruise? With a 48-volt motor battery, the boat is able to cruise comfortably for 7.5 hours. At top speed, the battery lasts for 3 hours. Meanwhile, on those stop overs, the battery has an automatic recharge system, which ensures that it will be able to pick up some power for a return trip. Additionally one may choose to buy an extra battery pack which consists of eight batteries. The Duffy 21 Old Bay electric boat is not made for your everyday speed use. However, the look and comfort is good enough to warrant a ride in it. Additionally, unlike diesel and petrol powered boats, this boat does not produce the deafening roar of a loud engine. You can also forget about the fumes. This boat has three things that other electric boats lack: class, a good reputation and most importantly, a long and rich legacy. 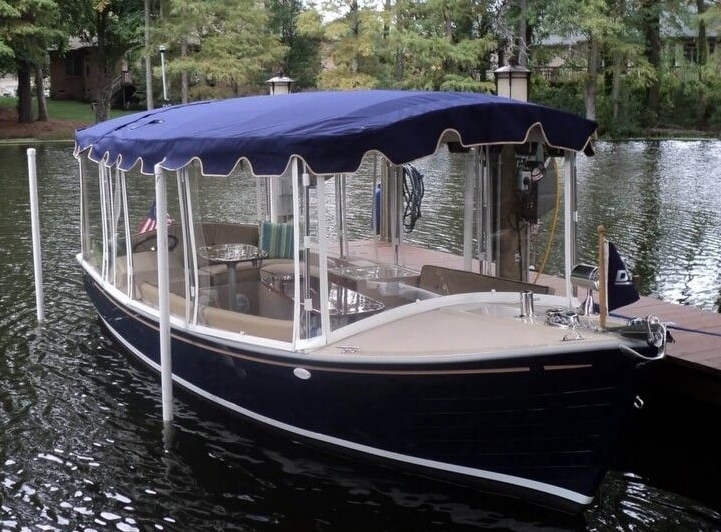 In a nutshell, the Duffy 21 Old Bay electric boat is a boat worthy of a try for daytime leisure cruise lovers. Previous Post:Want To Go Even MORE Green Than Electric? Go Solar!